Once you've extracted an image, you can also use the background eraser and history brush tools to clean up any stray edges in the image. Now you'll add the extracted weeds to the Egret image. 1 With the Weeds.psd file active, use the move tool (*,.) to drag the extracted selection to the Egret image. Position the weeds so that they fill the bottom third of the Egret image. The selection is added to the Egret image as a new layer. 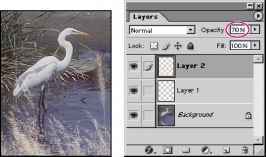 2 In the Layers palette, decrease the opacity of the new layer by entering a value of 70%. 3 Choose File > Save. 4 Save and close the Weeds.psd file.